Quick Reports is a Template driven report engine designed to meet most basic needs. You simply select the report template you want and select the fields you want to report on. Quick Reports are simple and secure, so in many cases you can safely allow your regular users to create their own reports. Quick Reports won't expose any functionality, data or fields that the user does not already have access to. You can enable this option from the Table Preferences. create and update Report Templates. Caption (Admin): The report caption is used when you want to save a report for future use. Saved reports are automatically available to all users. This allows administrators to create a number of basic saved reports. The name of the report will be the name on the report button created on the form. See below for more details of saved reports. The output format of the report. To export the data choose Csv or Excel. Single Row Reports return a single record in a specific table with all related rows. This could be used to print a recipe with all of its ingredients or an invoice with its details. Single row reports are used when you want to report on the current record such as for an invoice, recipe, or book report. Multi-row Reports combine multiple records into a single table. Multi-row reports are used when you want to look at a cross section of your data such as Todo Lists, Product listings or Staff listings. 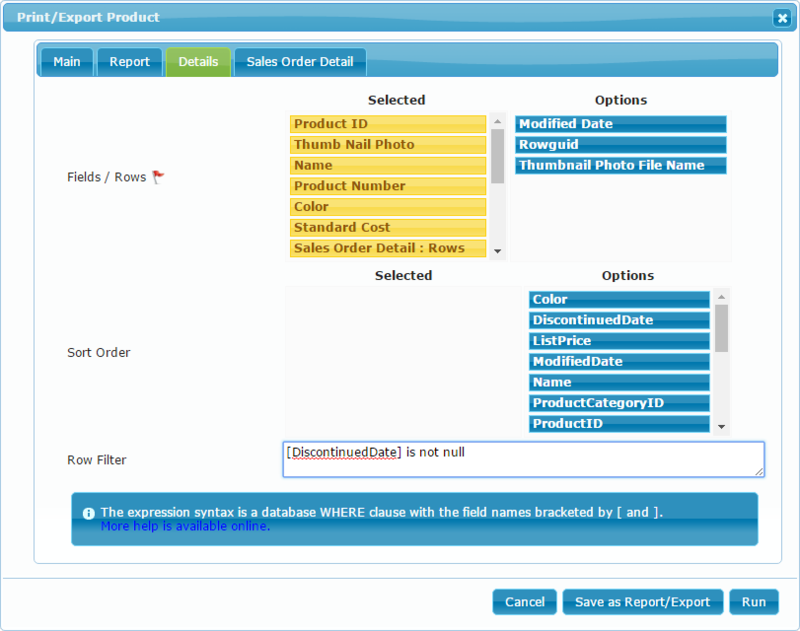 The Report Tab will be hidden if the output formats are limited to Csv or Excel. The Details tab is where you select the fields, field order and filter for your report. On the Details tab you can also specify the sort order. If the selected table has a related child table then you will also be able to select rows from that child table. In the example shown to the right you can see Sales Order Detail : Rows. When added, a new tab will appear named Sales Order Detail. 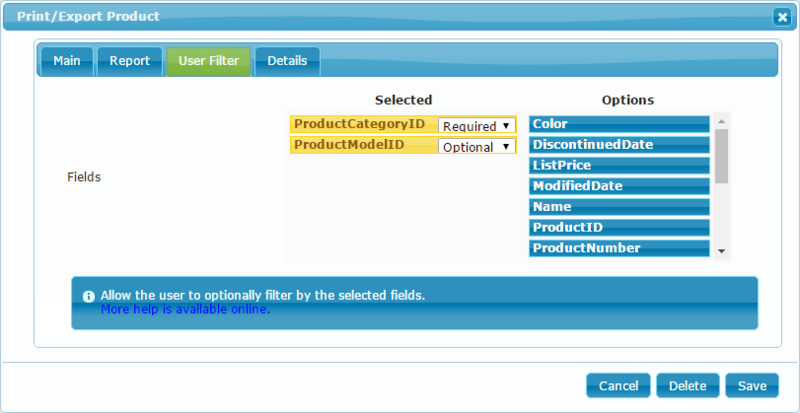 That tab will allow you to set the fields, sort order and filter for the Sales Order Details. NOTE: The row filters are only available to Admin users. See below for more details. Quick Reports uses the formatting rules for each individual field. These rules can be adjusted in the field preferences for that field. Once an Administrator creates a saved report then it can be run by any user. A significant benefit of saved reports is that an Admin user can setup the report with filters so that users can't print an excessive amount of information. The following are additional option only available with saved reports. When editing a saved report you can select multiple output options. This will cause the report to prompt the user for their preference. To optionally allow the user to export the report data you can include Csv or Excel as an Output Option. For Multi-row reports it is also possible to have the report prompt the user for filtering fields. The prompts can be required or optional.